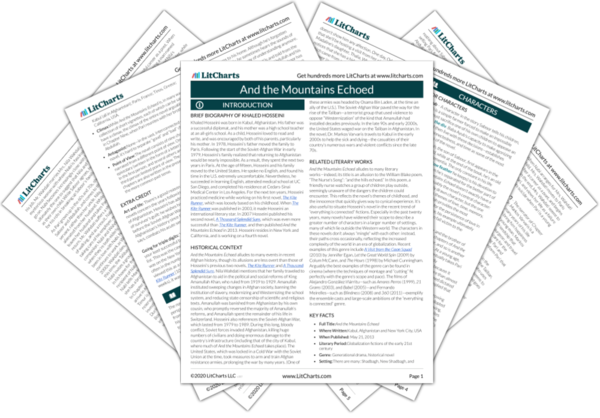 Instant downloads of all 945 LitChart PDFs (including And the Mountains Echoed). 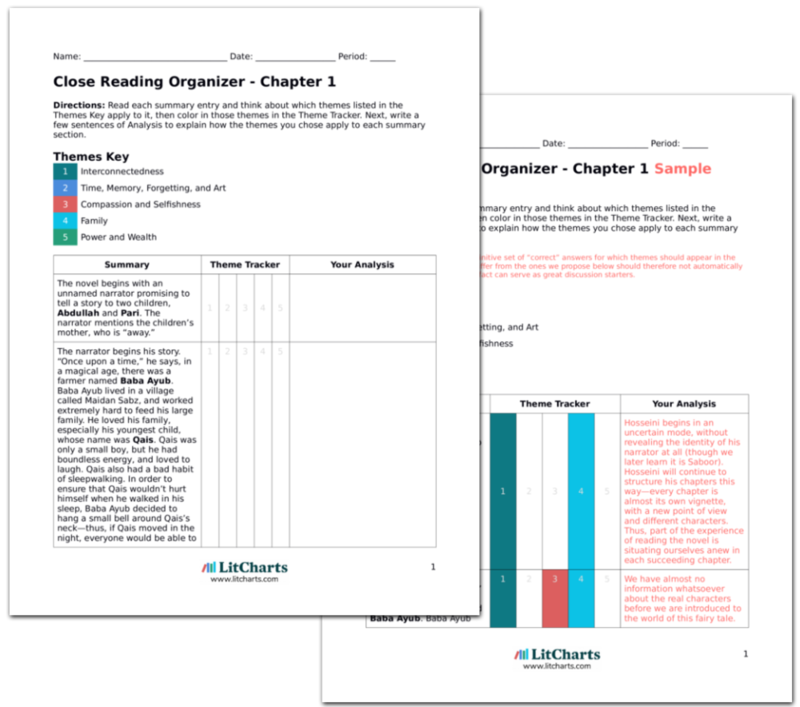 LitCharts assigns a color and icon to each theme in And the Mountains Echoed, which you can use to track the themes throughout the work. An unnamed narrator comes home from the clinic where he works and finds a message from a woman named Thalia, in which Thalia insists that the narrator call his mother. Thalia wants to know how his work in Kabul is going. Thalia refers to the narrator as Markos (whom we know from earlier chapters of the book). Markos keeps a picture of Thalia on his desk, one that he took years ago. A “crazed Italian girl” once tried to burn this photograph, though Markos doesn’t explain who the girl is or why she tried to burn the photo. Markos proceeds with his work. He’s been residing in a large house in Kabul since 2002. His landlord, Nabi, died very recently. Because Markos is distracted by thoughts of Thalia’s call, he decides to call his mother. Dr. Markos Varvaris has been a peripheral character in this novel for some time—ever since he learned that he was the recipient of Nabi’s letter. By beginning the chapter in a nebulous, unclear way, Hosseini reiterates one of his most important points: everyone has a story to tell, but sometimes, it takes a while to hear it. We wonder who Thalia is, who the Italian girl is—and if either of these characters will also get a chapter devoted to their perspectives and stories. Markos jumps back to explain how he met Thalia. They met in 1967, when he was only 12 years old. Thalia and her mother, Madaline, traveled to his home in Tinos, Greece to visit Markos, his mother, Odelia. Odelia had known Madaline since they were children—they went to mass together, and had always sworn to remain lifelong friends. Madaline, a beautiful woman, was then married to a wealthy man named Andrea Gianakos. Odelia warned Markos not to stare at Thalia, who had a large scar. Markos would later learn that Madaline was highly unhappy living with her husband. He was a right-wing figure, who supported fascists and opponents of democracy. Markos grew up respecting his mother, who was also his schoolteacher. Hosseini jumps around more than usual in this chapter, perhaps in imitation of Markos’s frenetic lifestyle, which entails a great deal of traveling. He also presents us with a different kind of family relationship than the ones we’ve seen previously. Markos respects and almost fears his mother, but it’s unclear what his mother thinks of him. There’s an uneasy distance between mother and son—they don’t hate each other, but they don’t seem to love each other very warmly or affectionately either. When Madaline and Thalia arrived in Markos’s home, Madaline introduced the two children. Markos noticed that Thalia was wearing a dark veil that covered her face, presumably to hide the scar Odelia had mentioned. Markos can still remember the moment, a few hours after meeting Thalia, when he caught a glimpse of her face for the first time. She was bending over to pick up a suitcase, and her veil came loose. Markos was so terrified by what he saw that he dropped the tray he was carrying. Thalia didn’t just have a scar—a significant chunk of her face seemed to have been torn off. We recognize the stark contrast between the “two Thalias” in the chapter: the fearsome Thalia, who repulses Markos when he lays eyes on her, and the Thalia with whom Markos has been good friends for most of his life. In actuality, however, we should be speaking of the “two Markoses”—the young, callous boy who grimaced at Thalia, and the mature, understanding young man who emerged later on. Back in 2010, Markos calls his mother. She asks him about his conversation with “the French woman” (whom we know to be Pari). Markos explains that Pari visited him last summer. He found her to be a beautiful woman, but prematurely aged, as if by deep tragedy. Paris stayed with Markos for a week in Kabul. He showed her the house where she lived as a child. It was during Pari’s stay in Kabul that she asked to visit Shadbagh. She also told Markos that he’s welcome to stay in the house in Kabul for as long as he likes. Hosseini doesn’t waste our time by repeating information: we’ve already read about the scene in which Markos calls Pari about Abdullah, albeit from Pari’s perspective, so we don’t need to read about it again. This is section again reminds us that Hosseini’s narrators’ self-worth is always biased. Thus, Pari thinks of herself as an ugly woman, while Markos—surely the more objective witness—thinks that she’s beautiful. 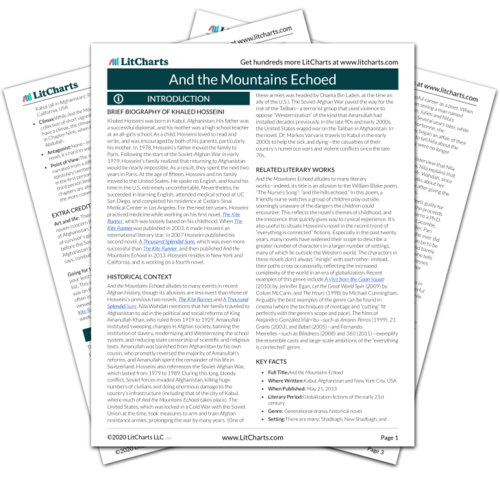 Get the entire And the Mountains Echoed LitChart as a printable PDF. Markos continues talking with his mother on the phone. He thinks to himself that his mother is suffering from neurological problems—she has muscle spasms, and finds it hard to hold anything for longer than a few seconds. At home, Thalia helps her get around the house. Like many of the other characters in the novel, Markos’s mother is suffering from medical problems, and relies on those who are younger and healthier to take care of her. This is another important part of the “family dynamic” for Hosseini. As a child, Markos was fascinated and horrified by Thalia’s appearance. Madaline and Thalia would visit Tinos often, and though Thalia was usually careful not to lift her veil, Markos would catch glimpses of her face whenever she visited. Eventually, he trained himself not to look at her. On the other hand, Markos grew to enjoy Madaline’s company. He came to understand that she was an enormously talented actress, who concealed her inner sadness behind a facade of happiness. Madaline told Markos about how her father used to beat her—and how, years ago, Odelia bravely protected Madaline from these beatings. As a child, Marko was both insightful and naïve, like many of the other children in the book. He was utterly immature about Thalia—refusing to look at her because he didn’t like the way she looked—but at the same time Markos was observant enough to realize that Madaline used happiness and cheer to disguise her inner depression—a rather impressive observation for someone so young. When Markos was a child, Odelia told him to spend more time with Thalia. When Markos protested that Thalia was a “monster,” Odelia angrily told him never to use that word to describe Thalia again. She ordered him to take a walk with Thalia along the beach—an order that he reluctantly agreed to follow. On the beach, Markos didn’t know what to say to Thalia, and she walked away from him, irritated with his awkwardness. Back at his mother’s house, Thalia lied and said that she and Markos had a nice time. As Markos watched Thalia lie to her mother, he became conscious of his own mother’s bad relationship with Madaline. Although Odelia was outwardly friendly to Madaline, she seemed to be getting tired of Madaline’s stories of her husbands. In this chapter we rarely, if ever, see interactions between Markos and his mother that don’t contain a dash of anger and irritation. In this case, Odelia’s irritation with her immature son seems perfectly justified—Odelia can’t believe that Markos could be so cruel about her friend’s daughter. Once again, Markos proves that he’s a good observer of other people: he deduces that Odelia doesn’t particularly enjoy Madaline’s company, since Madaline talks about nothing but herself all day long. Thalia and Markos spent more time together, but only because Markos didn’t enjoy being around Odelia and Madaline together—as he could sense Odelia’s discomfort. One day, as they’re walking by a shop, Markos notices a camera, and is surprised when Thalia names the exact brand of the camera. Markos reveals that he wants to be a photographer when he grows up, and Thalia displays more of her knowledge of cameras. Thalia is impressed with Markos’s ambition, and seems to smile as if for the first time. Markos and Thalia forge an important connection in this scene—one that, like some other connections in the novel, is mediated by the presence of art. However, unlike Idris and Roshana boding over DVDs, or Nila and Julien bonding over jazz, Markos and Thalia actually succeed in establishing a stable, loving friendship by talking about the arts. Several days after their conversation about photography, Thalia and Markos are standing in Markos’s house. Markos is preparing to take some photographs of his family. Rather than ask Odelia to buy him a camera, he’s made a homemade pinhole camera, using cardboard, a flashlight, cellophane, and simple chemicals. Thalia whispers to him that Madaline is upset: she’s had a big fight with her current husband, Andreas. Markos’s fondness for photography seems to correspond to his impressive skills as an observer of human beings. This is a common trope in literature, and especially film: the character who holds the camera is often the voice of reason. The next day, Markos assembles Odelia, Thalia, and Madaline on the beach near his house. He directs them to stand still and look at the makeshift camera he’s built. He then counts to 120—the number of seconds his subjects need to stay still. Markos’s photography introduces a new aspect to the novel’s theme of memory and forgetting. Pictures are often crucial aids to memory, and act as reminders of the past that don’t age or change. As Markos counts, the narrative cuts ahead to a scene from his early twenties, when he’s in college. Madaline has died, leaving her money (a large amount, given her first marriage to a powerful general) to Thalia. Because Thalia doesn’t want all this money, she gives half of it to Markos, telling him to use it for his college education. As the scene begins, Markos is in his bedroom with a woman named Gianna. Gianna notices that Markos’s room is decorated with photographs from all over the world. Markos explains that he’s been traveling and improving his skills as a photographer. Gianna notices one photograph of Thalia, which Markos took years ago with his pinhole camera. She asks if she’s his girlfriend. Markos denies this, but Gianna insists that he and Thalia are in a relationship. Suddenly, she takes a lighter and sets the photograph on fire. We now come full circle to the scene of Gianna burning Markos’s photograph of Thalia. And yet we’re almost no wiser about the relationship between Markos and Thalia than we were at first: are they lovers? Are they friends? Hosseini’s depiction of the love between Thalia and Markos reminds us of the friendship between Mr. Wahdati and Nabi: even if Nabi isn’t physically attracted to his employer, he feels a sense of connection and closeness that is certainly a kind of love. The image of the burning photo potently reminds us that no memory, even one preserved in a photograph, is invincible. Over time we forget about people, even if they’re the people who matter most to us. Markos remembers other times when he’s jealously guarded the photograph of Thalia. Once, in South America, he realized that he’d lost the photograph in the middle of a forest, and had to part ways with his friends in order to go back and retrieve it. When he found the photograph caught in a tree, he wept tears of joy. Evidently, Markos treats his photograph of Thalia like a kind of talisman: reminders that Thalia exists, and is still his close friend. We should be reminded of the way that Abdullah used to carry the yellow feather for his beloved sister, Pari. Markos remembers other episodes from his life. Once, as a young man, he was traveling through Caracas, and felt an intense sense that he was searching for something that he couldn’t put into words. Another time, in India, he collapsed in the streets from nausea and exhaustion. When he regained consciousness in an Indian hospital, he learned from a doctor that he had hepatitis. He also learned that a thief had taken all his possessions—except for the photograph of Thalia. Delirious, Markos thought to himself that he didn’t want to die so far from Thalia. In the hospital, Markos met a young boy named Manaar, who was rapidly dying of a tumor. As Markos slowly recovered from his hepatitis, he bonded with Manaar, often singing him songs and massaging his body. Despite Markos’s kindness, he couldn’t save Manaar’s life—Manaar died a few weeks after Markos arrived in the hospital. Markos is so moved by Manaar’s death that he stops traveling the world as a photographer and decides to apply to medical school. There are many characters in the novel who say that they’re searching for something inexplicable. In some cases, Hosseini implies that this “thing” is a parent: Pari with her real family, for example. Yet Hosseini isn’t so literal in the case of Markos (or Nila, another artist-figure). Markos’s predicament isn’t an uncommon one: people can’t always put into words what they want out of life. Hosseini suggests here that the best way to discover one’s true goals is to explore the world, and to help others. Markos doesn’t realize that he wants to help other people until he meets Manaar, and fails to save his life. It remains to be seen if medicine can provide Markos with the sense of peace and stability that he craves, however. The narrative returns to Markos’s childhood, when Madaline and Thalia were visiting Tinos. Madaline announces that she’s leaving Tinos, leaving Thalia to live with Markos and Odelia, supposedly for a few weeks. Madaline claims that she’s returning to her home to shoot a film. That night, Thalia and Markos play checkers, and Thalia explains that Madaline has found a new lover: the director of her film. As the game goes on, Markos finally works up the courage to ask Thalia how she sustained her facial injury. Thalia explains that Madaline’s first husband, Dorian, had a dog named Apollo. When Thalia was five years old, Apollo attacked her. In future years, Markos notes, Thalia would explain the rest of the story—the dog bit her, the surgery was a failure, and she got an infection that destroyed much of her face, including her left cheek and jawbone. In this section, we learn more about Thalia’s injury: where it came from, and what affect it’s had on her life. This process of narrative “revealing” seems to correspond to Markos’s growing love for Thalia—it’s as if Thalia is telling Markos about her injury for the first time, in the same instant that we as readers are also learning about it. As we learn more about Thalia, we also get a better sense for Madaline’s shallowness: she’s willing to leave her daughter behind in order to get a shot at being in a movie and finding a new romantic partner. This is another deeply troubled mother-daughter relationship, like Pari and Nila. Madaline leaves Thalia in Tinos with Markos and Odelia. Thalia doesn’t seem very sad to see her mother go. In the coming weeks, Odelia proceeds to homeschool both Thalia and Markos. Thalia’s presence in Tinos attracts lots of attention—boys sneak by Markos’s home in the hopes of seeing her face. One day, Markos tells Odelia that boys think of Thalia as a circus attraction. Odelia is so furious that she immediately brings both Thalia and Markos to the local school, tells the teacher that, as of today, Thalia is a student at the school, and removes Thalia’s veil. For the rest of her life, Markos notes, Thalia never wears the veil. As Markos’s calm count to 120 (in the earlier section) might suggest, the key player in this chapter is time. Over time, Thalia adjusts to her new life in Tinos, and Markos becomes increasingly comfortable spending time with Thalia—to the point where he can’t imagine living any other way. In a novel about the importance of love and familial bonds, Hosseini uses this section to make an important point: family bonds can’t arise overnight. They need time to grow strong and secure. Madaline sends word to Odelia that her film’s shoot is delayed—Thalia will have to stay in Tinos for longer than expected. Thalia immediately recognizes that Madaline is never coming back to Tinos. Over the course of the next few months, Thalia gradually adjusts to her new life, until the people of Tinos treat her as an ordinary person. One day, Thalia receives a letter from Andreas saying that Thalia needs to come to England, where she’s to enroll in a private school. The letter also explains that Madaline has eloped with her film’s director. Here Hosseini confirms the immense power of time in this section. Eventually the people of Tinos come to accept Thalia as one of her own, in spite of her facial injury. While Hosseini doesn’t reveal what Thalia’s response to her stepfather’s letter will be, we can surmise that she’ll choose to continue living in Tinos and spending time with Odelia and Markos—her adopted family. The narrative cuts ahead to 2002, more than thirty years after Thalia’s letter arrives. Markos discovers that Madaline has died. He learns that she was a successful actress and theater manager, and her company produced successful runs of major international plays. Markos is stunned to learn that Madaline lived less than six blocks from his own home in Athens. Markos is furious with Madaline—furious that her life turned out to be so successful, given that she cruelly abandoned her own daughter. He decides not to tell Thalia about Madaline’s death. This is one of the most important sections in the chapter, as we learn that Madaline—by all accounts, a shallow, narrow-minded, selfish woman—ends up living “happily ever after.” Hosseini again reminds us that the universe isn’t fair, and that in the tangled web of human interconnectedness there will always be tragedy and injustice. This is also basically the lesson that the div tried to teach Baba Ayub in the first chapter. After he finishes medical school, Markos decides to become a plastic surgeon. He realizes, partly because of Thalia’s advice, that physical appearances are extremely important, in contrast to what many people idealistically say. There were many reasons that Markos became a plastic surgeon, one of the most important of which, he admits, is because of his friendship with Thalia. He begins his career, and spends many months of the year traveling around the world to help children in impoverished parts of the world. In 2002, he takes a call from Amra Ademovic, a Bosnian nurse. She convinces him to move to Kabul to help Afghan war victims. Markos’s friends and family influence his career path at every turn. Here, we learn that he chooses to be a plastic surgeon—while there are many reasons for his choice, he admits that one of the biggest is his relationship to Thalia. It’s important that Hosseini renders this point a little ambiguously, as Markos (the narrator) might not be the best judge of his own motivations and life decisions. Some time in the 2000s, Markos arrives in Tinos, and Thalia picks him up from his ferry. He’s returned to Greece from Kabul for a brief time. Thalia shows Markos through Tinos, a city she now knows far better than Markos does. At the present, Thalia works as a “one-woman IT department”—she troubleshoots people’s computers and electrical devices. She does these things because she enjoys the work, not because she needs the money. We learnt that Thalia, at least, has had a long, happy life: she’s found rewarding work, which she clearly does because it brings her pleasure, not because she needs the income to survive. Thalia takes Markos back to his old house, where his mother still lives. Inside the house, Markos reminds Thalia of the offer he’s extended to her for many years: he’s willing to perform plastic surgery on her face for free. Thalia has always turned the offer down—she’s genuinely more comfortable with her “real” face. Thalia and Markos also discuss the eclipse that will take place over Tinos the next day. They’ll watch the eclipse through a pinhole camera. At this point in her life, Thalia is totally comfortable with a face that most people would consider to be hideously ugly. This is an important decision, and it reminds us that it’s possible to be happy with one’s own body (in contrast to what we’ve seen in the cases of Pari and Parwana). In the afternoon, Odelia, who’s been taking a nap, comes downstairs and greets Markos. Odelia and Markos drink coffee together, and Markos expresses his worry that Odelia is becoming lonely and sad in her old age. Odelia doesn’t disagree with Markos at all, but she reminds him that she’s impressed with the work he’s been doing in Kabul. She says, “You turned out good. You’ve made me proud, Markos.” Nevertheless, she doesn’t understand why Markos would leave his home in Athens to be in a violent, dangerous place like Kabul. Markos only says, “I had my reasons.” Suddenly, Odelia reveals that she’s suffering from Lou Gehrig’s disease. Markos is crushed, though he doesn’t show it. In this crucial scene between Odelia and Markos, Odelia shows her son some of the love and respect that he seems to have been craving for the better part of his life. It’s enough to make one wonder if the “thing” Markos was missing in life was precisely this: a loving mother. And yet even in this touching reunion scene (prefiguring the reunion scene in the next and final chapter of the novel), Markos isn’t entirely satisfied. He has to face the fact that 1) Odelia still doesn’t understand what he does, and thus can’t be entirely proud of him, and 2) Odelia is going to die soon, so they have very little time together as a closer, more loving family. The next day, around ten-thirty in the morning, Markos, Odelia, and Thalia gather outside to watch the eclipse. As the eclipse proceeds, Markos notice that his mother is smiling more “purely” than he’s ever seen before. As he watches his mother, Markos thinks about his conflicted relationship with her. For years, he’s wanted her to tell him, “You’ve made me proud, Markos”—words she’s never said until the day before. Markos realizes how different his relationship with his mother could have been—the happiness and warmth he and his mother feel for each other now is only a painful reminder of the coldness that existed between them for so many years before. Markos confirms the implications of the last section: his reconciliation with Odelia was bittersweet at best and heartbreaking at worst. Hosseini doesn’t idealize his subjects or their interactions with each other. Just because the novel seems to be pushing toward a tearful reunion between Abdullah and Pari doesn’t mean that Hosseini will give us one. Markos’s exchange with Odelia is an early sign of Hosseini’s fondness for anticlimax disguised as climax. Arn, Jackson. "And the Mountains Echoed Chapter 8." LitCharts. LitCharts LLC, 8 Jan 2016. Web. 23 Apr 2019. Arn, Jackson. "And the Mountains Echoed Chapter 8." LitCharts LLC, January 8, 2016. Retrieved April 23, 2019. https://www.litcharts.com/lit/and-the-mountains-echoed/chapter-8.